Oh, my Amazons, I had a doozy of a week last week. I made my pilgrimage to the land of pizza, garden dogs, and dipped Italian beef to visit my family. Because of inclement weather, I ended up staying in Chicago a little longer than anticipated and despite my best efforts, it broke me. I’d been trying to keep my eating habits on track, but by the end… Well, let’s focus on the present, shall we? 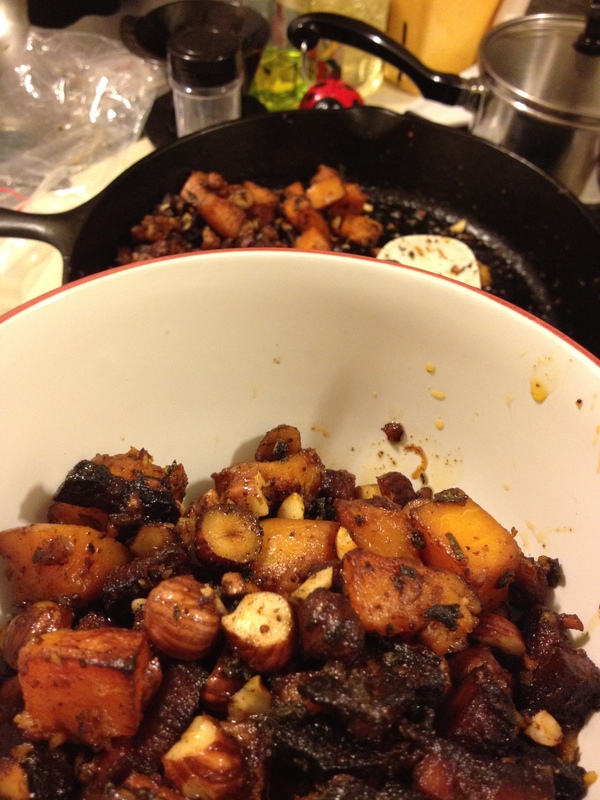 Butternut squash, pancetta, hazelnuts, and sage before we got down to business. 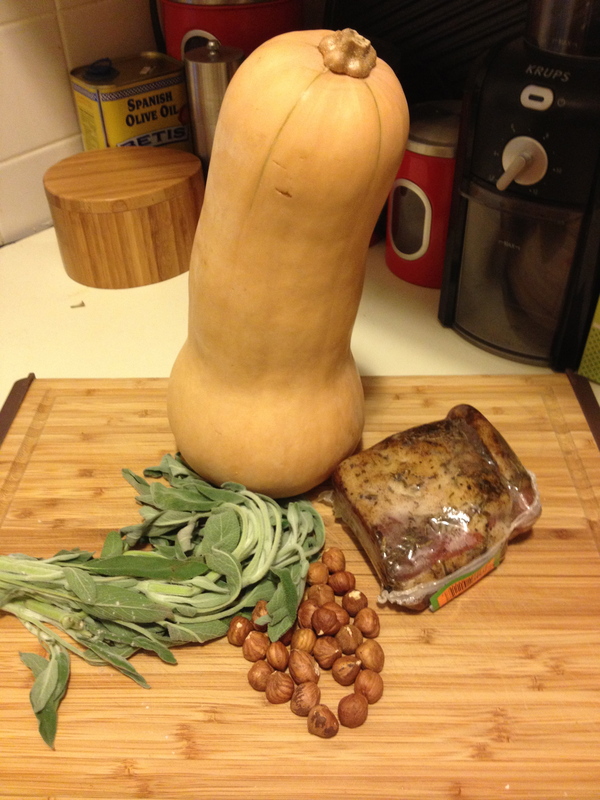 Before I left for Chicago, I’d purchased a butternut squash, but never got around to using it. Knowing how very stalwart the squash family is (making them fantastic winter veggies), I left it on the kitchen table, knowing full-well that it would still be good when I got back. And so it was. But how to prepare it? My tendency when faced with a food item that is naturally sweet, like squash, is to lean towards the savory, spicy realm. I like roasty. I like savory. I like varied textures. I also like pork. And what luck! I had some pancetta waiting to be used as well! Pancetta (pahn-cheh-tah) is basically Italian bacon. It’s salt-cured pork belly with pepper and sometimes herbs. As delicious as pancetta can be, if you can’t find it in your area, slab or thick cut bacon will suffice. Or if you have access to lardons (the French version), that would work perfectly as well. For the most part, you really just want to be able to dice the meat into chunks that will maintain a little chew when cooked. Sage is one of my favorite herbs. It always makes me think of Thanksgiving. And sage is the perfect pairing to pork! Fresh sage leaves are slightly velvety and super fragrant. Hazelnuts… well, honestly, they’re mostly for crunch. I just like some variant texture in my soft dishes. They do add some nutty flavor as well, but if you’re looking for the taste you remember from flavored coffees and the accompanying non-dairy, sugar-laden creamers, you’re barking up the wrong tree. The hazelnut (or filbert) has a very subtle flavor. This flavor, like all nuts and spices, is enhanced by roasting or toasting, but it’ll never compare to the in-your-faceness of the synthetic versions. First, you’ll want to chop your pancetta (or bacon) into about ½ inch chunks. Put in a cold pan with a drizzle of olive oil on low to medium-low heat. Halved squash; one intact, one gutted. While the pork is rendering its luscious fat, peel, seed (scoop out the seedy, squishy bits, like you would with a Halloween pumpkin), and chop your butternut squash into 1 inch chunks. You do NOT want to eat the skin of the squash; I have it on good authority that it just might mess with your plumbing. Remove the sage leaves from the stems and slice into thin ribbons. Run your knife through the hazelnuts until very coarsely chopped. Once your pancetta has gotten a little bit of browning and has rendered a healthy amount of fat, dump the squash, hazelnuts, and sage into the pan. Toss to coat. Sprinkle with paprika, salt, and fresh ground pepper. If you’re using a roasting pan, transfer all contents to that roasting pan. Pop in the oven and go watch some cat videos. 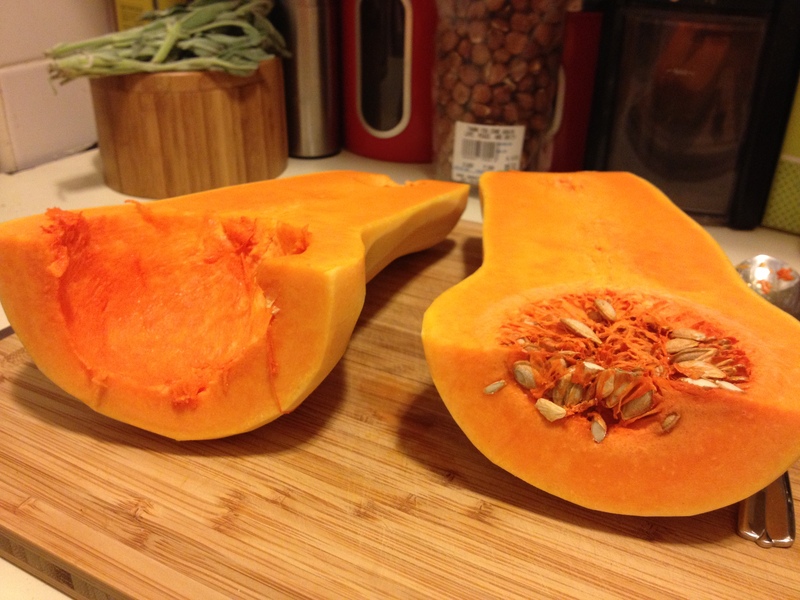 After about 30 minutes, check for fork tenderness in the squash. If you can pierce the pieces easily, your squash is done. EAT! I have you tell you, I’m definitely making this one a regular in my rotation. Not only is it painfully easy and delicious, it’s also extremely filling. In small portions, it could make a very nice side dish, but a bowl of it made a very hearty meal for yours truly. Hope you all had a great Valentine’s, full of giving and receiving love. And as always, love yourselves by eating well!